2+2=4: Does Truth Matter? - Could Judge Roberts Actually Be A Constitutional Conservative? Does Truth Matter? 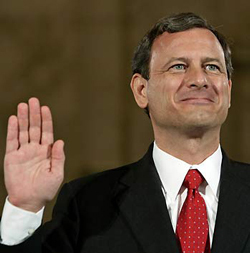 - Could Judge Roberts Actually Be A Constitutional Conservative? Every day almost, some Republican and/or conservative independent friend will tell me that I MUST support Mitt Romney, that they really did not want him as the candidate, but that since his machine destroyed all the other candidates that the handwriting is on the wall, and we all have to get in line and accept the lesser of two evils. Dr. Alan Keyes said in a speech in Missouri a month ago, that we have arrived where we are, having already lost our real liberties because we were convinced time and time again to accept the lesser of two evils. He said, "It is simply a point in fact, that when you keep choosing the lesser of two evils you are still accenting to evil, and the evil becomes progressively more evil, until there is nothing but lies, deceit, corruption, illusion and delusion. That's where we are." A friend of a friend just related the story of going to a meeting at the Heritage Foundation shortly after Judge Roberts was affirmed as Chief Justice. He said, "I asked some of the people I knew, who I thought were in the know if we constitutional conservatives could really trust Roberts. Of course, they assured me, they did, and I could." On this day, June 28th 2012 a day that will live in infamy - how did that turn out for us? Do you want to know why a supposed constitutional conservative like Roberts could skew the law, side with people who HATE the constitution and impose TAX policy contrary to the Constitution, that had not been imposed by Congress? Let us not kid ourselves, this was an act of treason, not an act of supporting and defending the Constitution by correct "interpretation." I was a precedent setting usurpation of power, subsuming to the Supreme Court the RIGHT to set tax policy. No other thing fits the facts, since the constitution clearly states that all Tax policy to be initiated by the congress. Congress said IN THE Affordable Health Care Act ITSELF that the Mandate was not a tax. That's the truth but truth does not matter, when you have a greater agenda. Truth can never get in the way of the greater agenda. Can you reason through why Judge Roberts would need to hang onto the power created in the so-called "Affordable Health Care Act"? Because the Neo-Cons are about POWER and not about fidelity to the Constitution. Surely today of all days ought to teach us that. Do you want to know why you can't tell the difference between Obama Care and Romney Care, why George Soros says either candidate will be just fine? Because the labels Right and Left, Conservative and Liberal, Socialist and Neo-Con have become meaningless. Why? Because they have become alike, using the same corrupt means and methods. Because in their scramble for a New World Order, pushing "internationalism" and/or "multi-nationalism" whichever at a whim, they are willing to tell any lie. They have sunk to deeper and deeper levels of corruption, holding no sacred honor, willing to commit any evil for the fulfillment of their true goal, a goal which they will kill to cover up. And now qualitatively there is no difference between the two, the internationalism proposed by the Marxists and the internationalism proposed by the Neo Cons, is both Constitution destroying, Sovereignty destroying and detrimental to the citizen they are sworn to protect. Neither - as today's ruling proves can be bothered with the rule of law, certainly not hampered by the restrictions of the constitution. Both philosophies have spouted the goal of "democracy" and have used the fomenting of "democratic revolution" to cover their power grabs, taking down entire nations for their cronies, placing them in the hands of those favored people, with NO regard for the cost in American lives, American fortune and less regard for the lives of the innocents who are killed and maimed in the process and the dupes they use to foment the revolutions. Both have become slaves to the New World Order and the difference in their vision of what that order is and should be is now qualitatively the same. Until true conservatives and even patriotic liberals, like John Kennedy was, become dedicated to the Truth, and value truth above all else, there can be no distinction between the liars on the right and the liars on the left, because right and left is just a suit they wear for the benefit of the useful idiots who vote for them. TRUTH MATTERS: If we wrote fiction we could not write the scenario where the program for universal healthcare, complete with mandate was planned by the Heritage Foundation and other supposed "conservative" think tanks almost twenty years ago, and passed into law by one of the most slippery politicians of our era. That man, the political chameleon and contortionist, Mitt Romney while claiming to be a conservative in Ted Kennedy's home state, and claiming to be an opponent of Ted Kennedy, passed into law Ted Kennedy's dream law, universal healthcare, with a mandate - something Kennedy had been seeking and working for, for 30 years. Then the next President took that model and passed it on a national level as Romney has repeatedly suggested it should be. Now, contort, change colors and Romney is supposed to be our stalwart, our only hope for repealing this monstrosity? And we BELIEVE it? Do you really believe it? TRUTH MATTERS: Mitt Romney, who claims all sorts of "clarity of thought" like over Gay Marriage, which he instituted in Massachusetts by fiat, now he is for the Defense of Marriage Act (which itself is a con game). . . then there is that Romney Care, now he is still for it for "his state" but definitely NOT for it for the Nation, and he claims that he will immediately "repeal" it, because it is "unconstitutional." Then he sputters and says, "Well, repeal and replace," though he has never given a hint of what the replacement would look like. TRUTH MATTERS: When Romney ran his campaign using Saul Alinsky BIG LIE tactics against every opponent who past him in the polls, and managed to buy the primaries via greasing the hands of almost all of his endorsers and spending many tens of millions in negative and lying T.V. spots, which managed to massively suppress the vote and rob the party faithful of ANY enthusiasm for the campaign, he PROVED that he is no more connected to the truth in June of 2012 than any other month in his life - TRUTH MATTERS. The ability to tell the truth MATTERS. To tell the truth, even if it costs you your career ambition is a matter of HONOR, something that none of the modern politicians seem to grasp. TRUTH MATTERS: The "Affordable Health Care Act" is a massive collection of power in the hands of the Scientistic Elite, controlled by the centralized government. It is the stuff of NAZI Germany and holds the same philosophical roots. NO politician will be willing give up this power, especially now that it has the support of "The Supremes". If no one is willing to stand for TRUTH and willing to FACE the Truth, and accept the PAIN of rejecting the LIE and the LIAR, even if it is your party's candidate speaking, we have lost the ability to communicate "the good." Then ALL is lie, and there can be no difference, no distinction between right and left, conservative and liberal, right and wrong, Marxism and Neo-conservatism because none are actually those things anymore, they are rather all con men, utopia seekers, bowing at the altar of the New World Order, with the ever-ready lie on their lips. Last decade we listened to the nails tapping as they were driven into the coffin containing our liberties and the last vestiges of sanity, morality and goodness our system could claim - and yes BUSH did it, standing on the shoulders of his father and Bill Clinton. The last three and a half years we have watch the coffin being drug to the grave, with insult and destruction to our traditions, patriotism, economy, businesses, home values, educational institutions, wealth, savings, and finally the all out assault on The Church and our religion freedom. Today Judge Roberts tossed the coffin in the grave, and it won't take but a few months until the grave is filled and weeds and brambles growing over the grand experiment that WAS the United State of America. Whether Obama or Romney hold the presidency makes absolutely no difference. This has but one way to go and it will not end peacefully. Or maybe it will. Maybe the drugs, the pleasure seeking hedonism, the total self-absorption in entertainment, T.V., games, movies, Iphones etc., etc., has left the masses hypnotized unable to ACT. Maybe we won't see the beauty of Liberty Minded people camping in the bitter winter cold in D.C. like the brave souls did in the Orange Rebellion in Kiev. Maybe it will just all end with a whimper, with a picture of some hippy standing down a line of tanks, an Ikon of hopelessness, then another interesting movie or video game, three more shots of tequila, another snort of coke, some really good weed and fade to black. It is all lies, truth doesn't matter, just the spin, the con. "We controlled the press" - no joke. Archpriest Symeon Elias - June 28th, 2012. The Propaganda Is A Many Decades Long Campaign. What Was JFK Talking About?